The goal here is to use a NeoGeo controller on another system. All modern systems use an encoder to 'compress' the number of buttons, or switches, into fewer pins. The upshot of this is that you can't simply create your own controller and plug it into your console. You can recreate the controller's innards, as in this Playstation example by Andrew McCubbin. You can see above that the closeup of the Saturn adaptor reveals a bunch of wires attached to what remains of a saturn control pad. 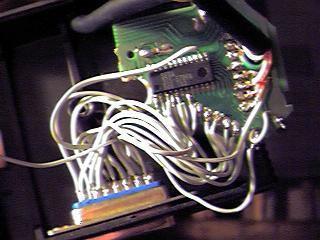 Each of these wires corresponds to a pin on the NEO control port (See pinout) and is attached to where the appropriate button on the Saturn pad would have gone. The NEO controller is ideal, because does not 'compress' the button data. It allows for one wire for every button, meaning we don't have a complicated encoder to decode or bypass when we muck about with it. Because of this, and to maintain some compatibility, we use this pinout for our custom sticks as well. You can see more on the NeoGeo Controller here. A controller is simply a set of switches, and in the case of the PSX and Saturn, a switch to 'compress' the data into fewer lines. A PSX controller, for example, has nine wires to the console, and 14 buttons on the pad. There's more Controller Theory here. Essentially what I've done is replace the switches on the original board the switches in my joystick controller. The new joystick's cable is basically an extension cord for the switches. 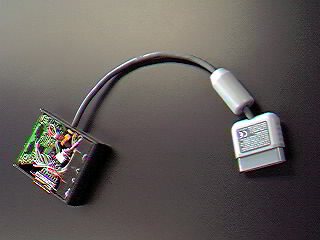 The original cable is still in use in order to preserve the factory connector, however the cable has obviously been shortened considerably. 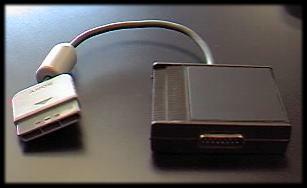 To complete the adaptor, I threw the entire mess inside an Atari 8-bit computer cartridge case, whose guts I had unceremoniously removed. I drilled a hole in the side, passed the cable through, tucked the whole thing in and called it done.